I am on a road trip with my '85 Caprice Wagon to South America (anniversary drive for her 30th) and due to the heavy loading the rear is sacking too much to have sufficient ground clearance for bad roads. So I need to get her lifted and the solution must be able to take some abuse. Keep in mind that I am on a low budget, so no fancy & expensive solutions. Yeah, I remember that my 2000 LeSabre had rear shocks that would automatically adjust the height of the rear end, depending on what was in the trunk. It was pretty cool - every time you started the car, it would adjust them. I guess they did that because the trunk was so damn big on that car (kinda miss that LeSabre - had so a nice ride!) - was a pretty big car! I'd recommend the Air Lift 1000. Highly recommended for B-Body wagons. Had them on my 92 Caprice, though they were old and un-connected. Yeah, they called it "Electronic Level Control". Honestly, not sure if it was an option or standard equipment - sounds like it might have been an option. That car even had automatic windshield wipers - the car would detect rain on the windshield and automatically turn the wipers on! Like I said, I really liked that car - wasn't exactly a great looking car, but was extremely comfortable! 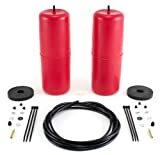 Airlift bags should be your ONLY consideration here they operate on 5-35psi easily supplied with a bicycle tire pump. They keep the load on the spring seats rather than the shock tower and don't compromise ride as much as other options. I have had OEM air shocks and then later airlifts on the same car and I would never consider airshocks again. Shocks run MUCH higher pressures harder to fill, place extra load on the shock mounts, more expensive. Some of the b-body guys with cars that came with auto-level shocks modified the system to run the lower pressure for bags. The bags last longer too. Thanks for your swift replies guys! I will try the air lift then. Sounds like an affordable option and your arguments for it make sense. Will let you know how the installation went and how I feel about the results when I'm done with it. Good point on running separate lines good tip with bags too. Shocks can work and add capacity so I can see why someone would like them after using them but again if you had experience with the bags in the same application I think you would like bags better. Helps if you let them get good and warm in the sun to soften up so you can get them into the spring. Shocks run on high pressure 20-150psi I think is typical, Airlifts are 5-35psi. I learned this the hard way when hauling roofing materials with the airshocks on the wagon and the gas station compressor only went to 90psi which was not nearly enough for the heavily loaded car. Also consider "Load Levelers". The are Heavy Duty Shocks with Springs built into them. I've had them all actually, Air Shocks, Air Bags, HD Springs, Rubber Blocks, etc, but when the back end of my '71 Impala needed a little lift, I choose the Load Levelers. A quick and in-expensive way to get a little lift and/or to carry a heavier load. I even installed them on my '66 C-10 once. Both times they worked great. I run the AIR LIFT bag system on my 95 Caprice wagon. I have had air shocks on cars in the past and like the way the air bags work. The other option would be a set of MOOG Cargo Coils they are a variable rate spring. Both about the same money.. The ride quality is better with the bags too. 1995 BLACK Carprice SS WAGON SOLD..
1992 Dk Gray Caprice SS WAGON SOLD..
2009 White TAHOE Z56 PPV..
HERD Club Vice President & Events Coordinator.